Spanning just 276 miles at its widest point, Chile is a long sliver of a nation, bordered by the magnificent Andes to the east and the Pacific Ocean to the west. Despite its small size, the Latin American country boasts a rich and diverse natural landscape, ranging from the dry plateaus of the Atacama Desert in the north to the network of icy fjords at its southernmost tip. Too long dismissed by travellers as a remote, far-flung destination, the nation’s natural beauty is now seeing it emerge as a must-visit location. Just as foreign interest in the Chilean landscape is picking up, the same can be said for its business climate. Reflecting the nation’s diminutive size, the Chilean stock market – known as the IPSA Index – is modest in its scope, yet offers plenty of potential for international investors. As financial markets around the world were rocked by political and economic turbulence throughout the past 12 months, the Chilean stock market enjoyed a successful year of trading. After five years of reporting unsatisfactory returns, the IPSA Index showed significant recovery in 2016, reaching a total return of 19.3 percent. This impressive result was largely driven by foreign investment in the nation, with international investors showing renewed confidence in the Chilean market. With its strong institutional set up, small public deficit and low levels of public debt, Chile continues to be the most competitive economy in Latin America, drawing investors from around the world. 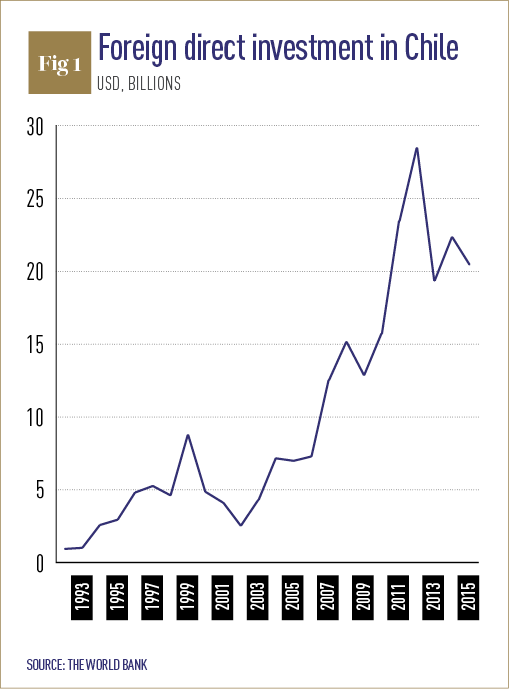 Since the mid-1970s, the Chilean economy has undergone a miraculous turnaround. From being one of the most protectionist countries in the world, the nation began to embrace free trade four decades ago, with a focus on international commerce in order to open up the economy. While these economic policies were first implemented under the Pinochet regime, they were continued with the transfer of power to a democratic government in 1990. Now the country remains committed to free trade, participating in trade agreements with a network of countries and welcoming large amounts of foreign investment. As creeping global protectionism poses an ever-increasing threat to international financial markets, Chile is looking towards a positive and open future. Foreign investors had a busy year on the Chilean stock market in 2016, snapping up shares and helping to drive growth. The country poses the lowest investment risk in Latin America, attracting investors from all over the world with its high quality infrastructure, stable macroeconomic system and rich natural resources. Despite the modest size of its stock exchange, Chile is one of the best-valued economies in the region. In terms of foreign direct investment, the nation is outperformed only by economic powerhouse Brazil. With a corporate tax rate of 25 percent – well below the 35 percent rate in the US – the country has been successful in luring in foreign investment from North America. Between 2009 and 2014, more than $122bn of foreign direct investment was made in Chile (see Fig 1), with the US alone accounting for around 20 percent of this amount. Among the high profile names looking to expand their presence in Chile is Amazon Web Services, which opened its first offices in the capital city Santiago back in January. The city is also home to Google’s first Latin American data centre, while Coca-Cola invested $1.3bn in the nation between 2012 and 2016, including $200m for the construction of a new state of the art bottling plant in the Santiago suburb of Renca. According to a 2015 report by the United Nations Council on Trade and Development, Chile is now the world’s 11th largest recipient of foreign direct investment, offering lucrative business prospects for investors in a climate defined by stability, transparency and competitiveness. The Chilean stock market has also enjoyed a significant boost from the nation’s local pensions fund. The country operates on a system in which workers save for their own retirement by paying 10 percent of their wages into individual accounts called AFPs, which are then managed by private administrators. Workers’ contributions to these AFPs flow into the nation’s capital markets, thus boosting overall growth. The system has now amassed over $172bn in savings and accounts for around 70 percent of Chile’s GDP. These valuable pension funds performed particularly well on the stock market in 2016, generating more than $900m over the past 12 months, and trading at the highest level in at least six years. With strong pension fund performance and a flurry of foreign investment activity, Chilean stocks are looking more attractive than ever. A drop in oil prices, a slowdown of growth in China and international political turbulence has created an uncertain global business climate for 2017. As a small, commodity-producing country, Chile is particularly vulnerable to external shocks, and as a result its stock market felt the impact of the unexpected results of both the US presidential election and the Brexit vote. Amid these unfavourable macroeconomic conditions, the Central Bank of Chile is implementing a number of strategies in order to cope with the challenges ahead. In an attempt to jump start economic growth in the nation, the central bank is expected to cut interest rates, following on from an initial cut to its monetary policy rate in December 2016. The anticipated cuts could slash interest rates to a low of 2.57 percent – a level not seen since the subprime mortgage crisis in 2008. Lower rates and additional liquidity should in turn boost the local stock market, further driving economic growth for the country. The Chilean stock exchange is also experiencing a surge in trading activity due to its high levels of equity risk premium, which currently stands at around eight percent. Given equity risk premiums effectively compensate investors for choosing equity investing over low-risk alternatives, the high premium rate has made local equity an attractive option for Chilean stock market investors. Furthermore, the nation’s IPSA Index is currently trading at notably discounted levels. Price-earnings ratios are favourable, while per-share earnings are expected to maintain a healthy growth rate, suggesting 2017 will be an opportune year for investing in Chile. These attractive stock market conditions not only set the Chilean IPSA Index apart from its peers in emerging markets, but also from its competitors in the Latin American region, where foreign backers are increasingly looking to invest. While the central bank looks to combat international economic uncertainty through careful manipulation of its monetary policy, the Chilean business world is also preparing for potential disruption at home. In November, Chile will hold its presidential election, following which the newly elected president will take office in March 2018. The Chilean constitution bars incumbent president Michelle Bachelet from re-election, as consecutive terms are not permitted under the current legislation. A new Chilean president may indeed signify a new economic direction for the nation, and the election result will undoubtedly have a profound impact on local financial markets. 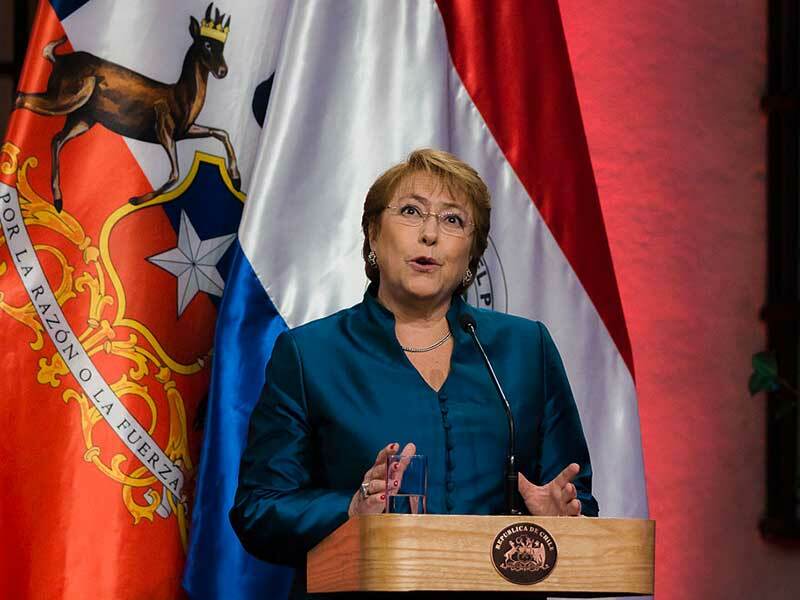 Bachelet’s presidency has been marked by numerous long-term economic strategies, and her government has succeeded in passing a range of significant policies, including ambitious tax and labour reforms and taking the first steps towards rewriting Chile’s constitution. These far-reaching reforms have had a marked effect on not only the nation’s economic growth and financial markets, but also on the overall levels of business confidence in the region. When Bachelet was first elected in March 2014, the Chilean monthly business confidence indicator stood at a high of 51.8 points, but has since plunged to just 39.2. Similarly, Bachelet’s approval ratings have more than halved since the early days of her presidency, hitting an all-time low of just 19 percent in the summer of 2016. With business confidence steadily sliding under Bachelet’s watch, the Chilean financial sector is eagerly awaiting election day. Until recently, the leadership race looked set to be dominated by two former presidents: Sebastián Piñera and Ricardo Lagos. While these candidates are both considered pro-market individuals, a new name has come to the fore as well: Alejandro Guillier, a radical left-wing political force and current congressman, has entered the frame as a strong presidential candidate, effectively ending Lagos’ chances of winning. The race now appears too close to call between Piñera and Guillier, creating an atmosphere of uncertainty and nervous anticipation for local Chilean markets. With the two candidates occupying opposite ends of the political spectrum, this year’s political developments will prove to be significant drivers of the Chilean economy – although whether this impact will be positive or negative remains to be seen.